Shilpa Agarwal‘s Haunting Bombay immerses readers in a deeply saturated drama and literary ghost story reminiscent of the Bollywood films the Mittal family’s driver Gulu adapts into his own adventures. Set in Bombay, India, the story spans two decades from the end of World War II into the 1960s. Each member of the Mittal family is vivid from the main protagonist Pinky, a thirteen-year-old girl uncomfortable with her place in the family and grandmother Maji, who keeps the family unit running smoothly and keeps all of its secrets secure to self-centered Savita, Maji’s daughter-in-law bent on driving Pinky out and her seventeen-year-old son Nimish, who always has his head in a book and is too timid to talk to the girl he has a crush on. Pinky’s mother dies during the partition of India, forcing her to become a refugee, but Maji takes her granddaughter into her bungalow, along with her son, his wife, and their three boys. The mystery of the bolted bathroom door at night is resolved when Pinky in a fit of frustration unbolts the door. Haunting Bombay is about the secrets buried within a family and the ghosts tied to those secrets until they burst through the bathroom door. Agarwal’s poetic language is like a siren song, pulling the reader into the Mittal family’s struggles with one another. With the start of the monsoon season accompanied by the heavy rains, the ghost grows more powerful and the drama more turbulent. Readers looking for a ghost story will get more than they bargained for with Haunting Bombay. It’s a ghost story, mystery, and historical novel carefully crafted to hypnotize the reader. Shilpa Agarwal kindly took the time out of her busy schedule–at the last minute, I might add, because I am incredibly out of sorts with my own schedule–to answer a few questions. I graciously thank her. 1. Please describe yourself as a writer and your book in 10 words or less. Myself as writer: A researcher, thinker, poet, dreamer. 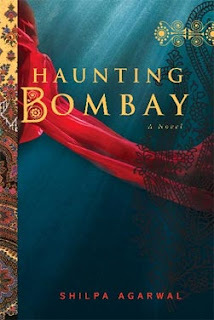 Haunting Bombay: A literary ghost story set in Bombay, India. 2. Haunting Bombay features a ghost story; what inspired you to use a haunting to illustrate family secrets and how they are uncovered? Haunting Bombay takes place in a wealthy Bombay bungalow and opens the day a newborn granddaughter drowns in a brass bucket while being bathed. The child’s ayah (nanny) is blamed for the death and is immediately banished from the household. The child and her ayah are silenced in the realm of human language – they have no voice or power in the bungalow – so I had them come back in the supernatural realm in order to speak the truth of what happened that drowning day. I remember a quote from Buddhist nun Pema Chodron that is something like, “Fear is what happens when you get closer to the truth.” I wanted my characters’ journey to discovering the truth to be both frightening and enlightening, involving self-reflection, compassion, and sacrifice. 3. Do you have any particular writing habits, like listening to music while writing or having a precise page count to reach by the end of each day or week? When I was writing Haunting Bombay and my children were very young, I used to get up at 4:30 each morning to write because that was the only time in the day I had to myself. Now I write while they are at school. I always light a candle before writing, put my editorial hat away, and allow the story to unfold as it comes to me. Later I go back and rewrite but I always like the first draft to come from a place of emotion and instinct. My writing process is very organic. I never write an outline because, inevitably, the story will take an entirely different direction than the one I’ve plotted out. So I let the story flow, and however far I get that day is fine with me. 4. Name some of the best books you’ve read lately and why you enjoyed them. During my book travels these past months, I’ve met wonderful authors whose books I subsequently read, including Cara Black’s Murder in the Marais (Aimee Leduc Investigation) , David Fuller’s Sweetsmoke , and Diane Gabaldon’s Outlander . This weekend I spoke at an event with Judith Freeman, Ann Packer, and Jacqueline Winspear so Red Water: A Novel, The Dive From Clausen’s Pier: A Novel , and Maisie Dobbs are on my current reading list. There is something almost magical in reading a book after hearing an author speak about it, and in this process my own interests have expanded into new genres of literature. I also recently read Kathleen Kent’s The Heretic’s Daughter: A Novel which I thought was an engaging work of historical fiction. 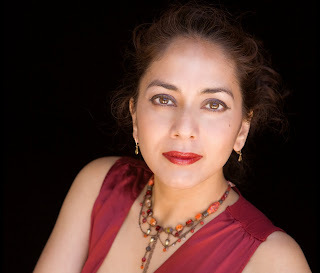 For the rest of my interview with Shilpa Agarwal, check out my D.C. Literature Examiner page. 1. Leave a comment about why you like ghost stories or describe a scary story you heard or told. 2. Leave a comment on my D.C. Literature Examiner interview and get a second entry. 3. Tweet, Facebook, or blog about this giveaway and leave a comment. Deadline is Oct. 16, 2009 at 11:59 PM EST.